If you're listening, maybe I'm talking to you, too. 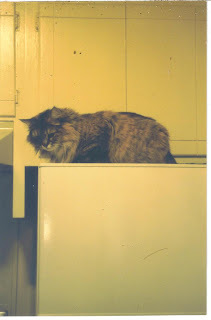 Way back in August of 1997, I was living in a little house in Eugene, Oregon with my old cat Pounce. My long term girlfriend had left me that May, but I was getting over it. I worked at my janitorial job at the Eugene Public Library. I wrote poems, tinkered with old computers, thought about making a Web page. Life was pretty good, actually. Then, on or about August 3rd, I heard a meow out on my side porch. I thought the neighbor's kitten had gotten loose. When I opened the door, a beautiful little tortoiseshell calico ran inside the house. She was about a year old, so far as I could tell, and she was all fur and bones. She dashed over to Pounce's food dish and gulped down over the food before I could throw her out. I thought I didn't need another cat. I called the new arrival "Spot," as in "Out, damned Spot!" But it was too late. She had already won my heart. Pounce tried to be patient, even when the kittens arrived. But that's another story. Spot and I had almost 15 great years together. She died a month ago tomorrow. Here's to you, Spotter Cat, to your intelligence, and your sly sense of humor, and your indomitable will. Here's to the way you would hide in the garden or under the house, and to the way you would yowl when I would pick you up and bring you in. And to the way you would come to investigate when I played the harmonica. I hope you are having fun out there in the unknown universe, wherever you are, and that you never have to go inside any more. I believe that it's possible to create an egalitarian world. Talking to Myself by Amazon Grace is licensed under a Creative Commons Attribution-NonCommercial-ShareAlike 3.0 Unported License. Permissions beyond the scope of this license may be available at egb16@hotmail.com.